The recordings for the Solid Rock Blues Band, The Barking Aunts, Mirjam Tamara and some other demo’s for other bands and vocalists were al made using my computer as a ‘DAW’, a Digital Audio Workstation. For many years I’ve recorded in the livingroom. But since 2015 I’m having my own small home studio. In this video I give a short tour of the studio and a short recording demo. When I began recording I used my computers build in soundcard and a cheap microphone. These days I have some “serious equipment”. One of the things I made a rule of thumb: “It shouldn’t cost much”. 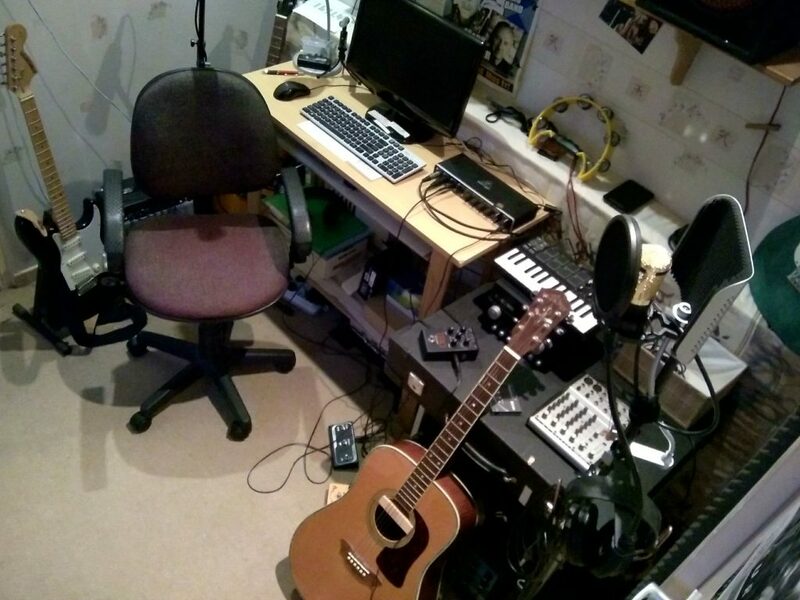 So it is a budget studio, but despite that, it is possible to record decent sounding tracks! The more-or-less full list of equipment in my studio can be found here. Today I’ve recorded “Sing Me A Song”, a free song available on SoundCloud (and Audiomack also soon) in my studio. It’s less than two minutes(!) and the full lyrics are included at soundcloud. I’ve posted a short demo of it before. Including a video. The song was recorded using Ardour Studio (here’s a video about the small and low budget studio I operate) and for the acoustic guitar I’ve used my Washburn guitar. For recording this great acoustic guitar I’ve used a (very) cheap Chinese pickup I’ve bought some time ago (video/demo). I also added a condenser mic in front of it, so it’s got two sound sources in the recording giving it more depth and ‘space’. For drums and bass I’ve used my Digitech Trio pedal and finaclly the electric guitar is my Fender “Starcaster” Stratocaster on rhythm and lead guitar. For this guitar I used the JoYo “American” pedal. A superb pedal that works very nice with Fender guitars but also with my Gretsch of course. Finally I recorded the vocals using my BM-800 mic. One of the best condenser mic’s you can get for the money, paid less than $20 dollar for it!